RIT biology professor L. Kate Wright knows it’s a good day when her students get a little loud. She likes to hear the volume rise as students discuss Clicker questions, case studies or the models that represent biological structures because it means they’re engaged with the material. Wright’s student-centered and active classrooms have earned her an RIT Eisenhart Award for Outstanding Teaching. Wright, associate professor of biotechnology and molecular bioscience in RIT’s Thomas H. Gosnell School of Life Sciences, started at RIT in 2005 as an adjunct professor. 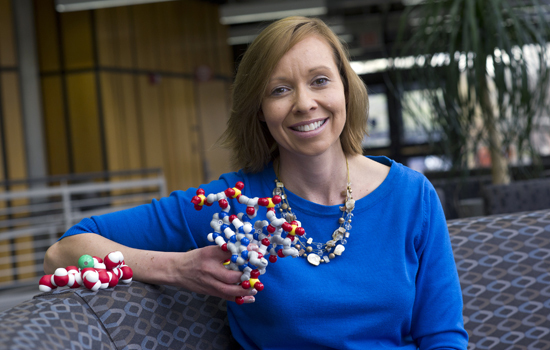 An alumna of RIT’s biotechnology program, Wright earned her MS and Ph.D. in pathology at the University of Rochester and completed two post-doctoral fellowships there before starting teaching at RIT. Wright tries different engagement strategies in class. She tries not to assume what students know, especially when teaching a required class such as Cellular and Molecular Biology, in which students have different levels of preparation. Wright uses pre-homework assignments—due at the beginning of each class— to “level the playing field” and give everyone a common starting place. Wright is grateful to department head Larry Buckley for allowing her to teach Cellular and Molecular Biology in smaller sections instead of large groups.That support and flexibility has aided the changes she and her colleagues have made in how they teach some of the required classes in the Gosnell School of Life Sciences. “We really tried to re-envision and change our introductory biology course to smaller sections and use more active engagement strategies, with the idea that these are freshmen and we don’t want them to feel as though they are invisible in the class,” Wright said. Grading for the class and corresponding lab were combined and restructured to reflect different styles of learning. Wright is one of the first RIT professors awarded tenure based on her scholarship in biology education research. She is a member of the Science and Mathematics Education Research Collaboration within RIT’s CASTLE, or Center for Advancing STEM Teaching, Learning and Evaluation.